Are you looking for a quick, grab and go breakfast or snack?! Look no further – these oatmeal cashew muffins are super easy to make and are easy to pack when you are on the go. The muffin base consists of oats, banana, eggs, chia, flax and cashew butter that are very versatile and can be mixed with a variety of toppings depending on your mood. This recipe is also lower in sugar and provides a healthy mix of carbs, protein and fats that will give you energy to make it through your next run or afternoon meeting. Instructions: Preheat oven to 375 and grease muffin tins using coconut oil or oil of your choice. In a large mixing bowl, mash bananas and add remaining ingredients, except for the toppings. Mix well. Fill muffin tins to the top and then add additional toppings as desired. Bake for 25 minutes or until muffins are cooked through. Remove from oven and transfer to a cooling rack. Store in an airtight container in the refrigerator for 3-5 days or freeze. If you are craving a fast and fresh meal, this recipe is a must! For a different flavor, substitute tofu or hummus for the shrimp and adding in different veggies for various flavor combos. This recipe makes about 8 spring rolls and will feed 2-3 people. Cook shrimp according to package. Slice all vegetables and avocado lengthwise in thin slices. Once shrimp is cooked, individually soak rice paper wraps in water, following the instructions on the package. Once rice paper is soft, remove and place on kitchen towel or cloth. 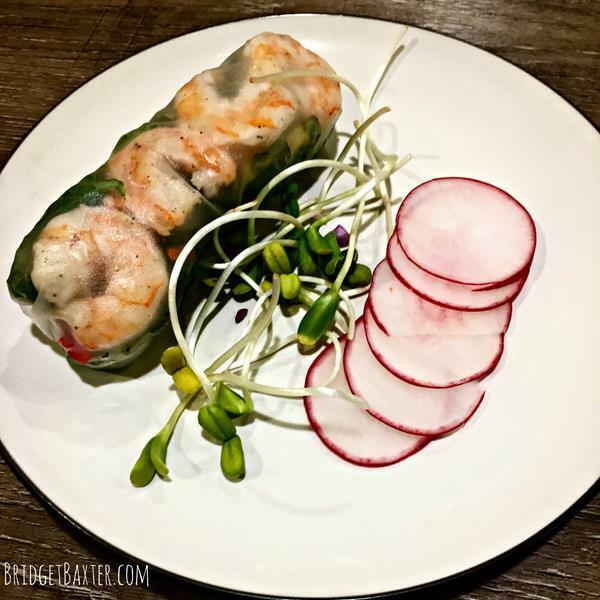 Add shrimp, veggies and avocado and roll rice paper to enclose all ingredients. Mix cashew butter, lemon juice, worcestershire and soy sauce in a small bowl. The sauce will slightly thicken; feel free to add a small amount of water if needed. Who doesn’t love a soft, homemade chocolate chip cookie!? A few weekends ago I had a craving for chocolate chip cookies, so I rifled through the internet looking at recipes and picked the ingredients I liked from three. I combined ingredients together and wound up with these cookies. It was a gamble, but they turned out so soft and amazing! If you haven’t tried coconut sugar in your baking, I encourage you to give it a shot. Coconut sugar is low on the glycemic index and includes vital amino acids compared to regular white sugar. I also substituted whole wheat flour instead of white. Preheat oven to 375. In large mixing bowl, cream butter, eggs, vanilla and sugar. Keeping mixer on low, gradually add in baking soda, flour, shredded coconut and salt. Mix well. Stir in walnuts and chocolate chips. Refrigerate dough for 30-60 minutes. Using a tablespoon measuring spoon, drop cookie dough onto an ungreased cookie sheet. Bake for 9-11 minutes*. 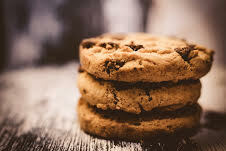 *Baking Note: Because coconut sugar is darker in color it turns cookie dough and cookies darker. When checking cookies to see if they are done, don’t judge by color, but instead how crispy they are getting. Now go for a run so you can eat more cookies!!! Who doesn’t love a warm bowl of soup after a cold winter day?! Garbanzo beans make a great addition to the traditional recipe and add an extra bonus of protein, fiber, magnesium and iron. Heat large soup pot with 2 tbsp olive oil. Add onions. Saute 5-10 minutes or until soft. Add in minced garlic, thyme, rosemary, salt and pepper and another tbsp olive oil. Stir and saute another ~5 minutes. Sprinkle whole wheat flour over onion garlic mix. Add in red wine and bring temperature to med-high, stirring frequently until the wine has cooked off. Once wine has cooked away, continue to saute another 5-10 minutes making sure onions and garlic are soft. Add in garbanzo beans and beef broth. Simmer for ~20 minutes. While soup is simmering, pre-heat oven to 350. Slice baguettes about 1” thick and brush with olive oil. Bake in oven for 5-7 minutes until golden brown and crisp. Place 1-2 slices of baguette in wide mouth soup bowl and top with cheese slices. Using a soup ladle, pour soup mixture over cheese and bread. Wait a minute or so for the cheese to melt. Dig in! Winter nights are here so bring on the cozy comfort foods! This easy-to-make black bean soup is a great meal for post-winter running and will warm your body right up after braving the cold. Black beans are packed with fiber, folate, vitamin B6 and the complex carbohydrates your body needs after exercising. Black beans also have a high levels of phytonutrients and antioxidants, which can offer many health benefits. Enjoy this recipe with a grilled baguette, a side arugula salad or just by itself. Using a large pot or dutch oven, saute onions, garlic and anaheim chili over medium heat or until soft. Add in carrots and red pepper and mix well with other sauteed ingredients. Add red wine. Turn up heat and stir often until it cooks. Add in beans, tomatoes and broth and bring ingredients to a boil. Reduce heat and simmer for 10 minutes. Using an immersion blender or food processor, blend ½ of the soup until creamy and add back into the chunky part of the soup. Mix well and simmer for an additional 5 minutes. Top with sliced avocado, goat cheese and pumpkin seeds (pictured) or cilantro, shredded cheddar cheese and tortilla chips. Good food doesn’t have to be complicated or expensive! This meal takes about 30 minutes total and is ready to serve once it’s in the oven. Salmon is a great source of omega 3’s and protein, providing many health benefits including reducing inflammation in the body and improving cardiovascular health. Cooking in parchment packets improves flavor and also helps seal in the nutrients of the food being cooked, which are simply extra bonuses to an already low maintenance, delicious meal. Preheat oven to 425 degrees. Drizzle olive oil over asparagus spears and season with salt and pepper. Place asparagus side by side in the bottom of the parchment packet. Spread pesto mixture evenly over salmon fillet. Top with cherry tomatoes and drizzle ½ the amount of lemon juice over all. Place salmon on top of asparagus spears in the parchment packet and fold edges of packet to create a seal. Place packet on a baking sheet and put in oven for 20 minutes, or until salmon is cooked through. Cut open packet and drizzle with remaining lemon juice. Serve and enjoy!